Playing live online chess can be great fun, but sometimes you just want to play another person over the board. As we all know, playing over-the-board chess has its own set of rules and guidelines that must be followed in tournament play. Breach of these serious rules could mean a loss of the game or even expulsion from the tournament. Not all chess, however, is serious business. 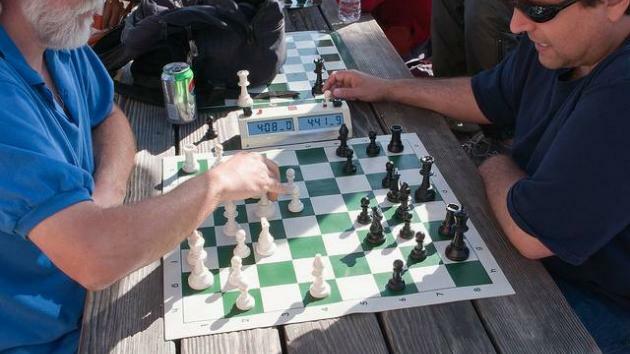 Most chess games are quick and casual, played to pass the time or for the sheer enjoyment of the game. In these contests, good sportsmanship often replaces the letter of the law. Even casual blitz games, though, have well established rules of etiquette that players should respect. After all, what good is winning if you can’t happily shake your opponent’s hand afterward? In order to properly respect chess, there are certain things you should always do at the board. Following these customs can help you win and make the game more fun at the same time. 6. Always offer a draw by extending your hand. Sure, you could offer a draw verbally, but then your opponent might not hear you. It's best to avoid all confusion at the board by wordlessly offering a draw with an extended hand. This way, your opponent can be sure you are proposing to split the point. Opponents respond so well to this magnanimous gesture, they have been known to accept the draw even in totally won positions! This can be a valuable last resort to save a lost game. 5. Always offer more than one draw. Is there any facet of life where persistence doesn't pay off? If your opponent rejects your first draw offer, nothing shows more respect for both the game and your playing partner by offering it soon again. Making two, three, or even four draw offers in a row lets your opponent know you are serious about your proposal. It's like picking up the check at dinner. Often, your companion will want to split the bill until you insist on paying. It's the same in chess with splitting the point -- it's only polite to make multiple offers. 4. Always hit the clock as hard as you can. They say chess is 99 percent tactics. I say life is 99 percent confidence. It’s amazing the success you can achieve just by maintaining a self-assured attitude. The best way to project this confidence at the board in a blitz game is to hit the clock as hard as you can after each move. Not only will this cement your image as an opponent to be feared, it will also boost your self-esteem each time you move a piece. Your opponent will appreciate playing such a self-assured player, even if he has to buy a new clock after the game. 3. Always stare directly at your opponent. Maintaining eye contact is polite in most social situations, and chess is no exception. In the corporate boardroom, eye contact can mean the difference between closing the deal and losing the account. It’s no different at the chess board. Staring directly at your opponent at all times lets him know you appreciate the game and his role as your playing partner. 2. Always check your phone at the board. Even in blitz, it’s important to make good use of the down time while your opponent is thinking. Sure, you could use that period to calculate and plan your next moves, but you have your own time for that. Quickly checking your phone at the board is a great way to keep up with your social networks and text conversations. What’s more, your opponent will know you are a well-rounded, sociable person with a life outside chess. Bonus tip: Make sure your phone beeps for each incoming message, so your opponent knows just how popular you are! 1. Always offer your opponent a refreshment on his move. Calculating chess moves is hard work, especially in blitz when time is limited. To be polite, wait until you've reached a complicated tactical position, and then offer your opponent a drink or light snack while he’s pondering his move. Your opponent will appreciate the refreshment, and especially that you offered it when he needed it the most. There’s nothing like a time scramble to work up a sweat in chess. Be ready to hand your opponent a bottle of water at just the right moment. Let us know other things you should always do in live blitz games in the comments and on Facebook. Watch IM Keaton Kiewra's live blitz session: An Incredible Blitz Medley! Learn how to make a draw in the Chess Mentor. Can You Solve Our 2018 Holiday Chess Puzzler?